Harness power dreams. 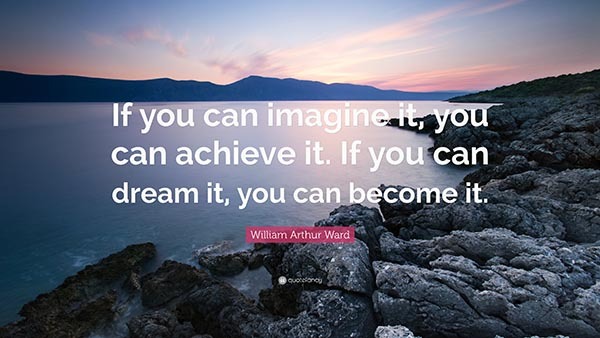 William Arthur Ward's quote should be a powerful call to action. Dreams have tremendous power. They sustain us through desperate times and drive us through difficult ones and give us hope for the future. More important-they inspire us! Where would human beings be without dreams? Would we have explored distant places or invented the means to travel to those destinations? How many children are alive today thanks to the dreams of doctors and scientists? What works of art lift the hearts of countless masses due to the dreams of artists? In the end so much is possible thanks to the power of dreams and yet so many people seem unwilling to free their own dreams. They shrug them off, ignore them, or reject them entirely-too difficult, impossible, ridiculous, meaningless. But even the most frivolous dreams have meaning. If one person's life is touched by that dream-whether they are inspired, changed, or simply lightened-then that dream has power and meaning. It is sad that in our society to be called a "dreamer" is actually an insult. In many societies, to be a dreamer was once a high calling. If we think of all that dreams have caused-from space travel to the creation of the United States of America to a polio vaccine-perhaps we can make dreaming acceptable again. What do you do with your own dreams? Do you dare to voice them, dare to do something about them? Or do you instead spend your time finding excuses for why your dreams are impossible? No dream is impossible! You have to believe that and you have to dare to dream, or your dream will be impossible, but there is no one to blame but yourself because you never let it become possible. Perhaps that is why so many perceive being a "dreamer" as something negative, because they view it as a passive exercise, but being a true "dreamer" is anything but passive-it requires action! Yes, it is scary to dream, it is scary to take a leap of faith, to risk yourself. Even more frightening than failure is the knowledge that once you take that risk you will have lost your dream forever. But do not be afraid, you can succeed, but even if THIS dream does fail, once you've become someone that dares to dream there will be others. Once you've made that change, once you've become a dreamer, there is no going back--and that is certainly a step on the road to success! So, remember to Dare to Dream!